US sales of security alarm systems will rise 5.1% annually, driven mainly by further gains in construction activity, especially in the institutional market. The consumjer market accounted for over 40% of alarm system sales, making it the largest end-user. This same market also represents the largest single outlet for intrusion alarms, since affluent people are more likely to invest in these systems both because they are more able to afford the price and have valuable assets to protect. The elderly are also a growing market segment for PERS alarms, as they increasingly prefer to age in place safely. This study analyzes the $3.8 billion US market. It presents historical demand data (2006, 2011, 2016) plus forecasts (2021) by product (life safety, intrusion, PERS and related) and market (consumer, trade and distribution, industrial, financial institutions, government, services, offices, healthcare, educational, lodging, air transport, other institutional). The study also offers company market share and analysis of key players including Honeywell International, Johnson Controls International, Melrose Industries (Nortek), NAPCO Security Technologies, Robert Bosch, Royal Philips, Siemens, Stanley Black & Decker, Tunstall Healthcare, and United Technologies. 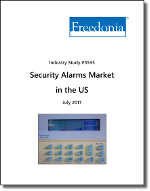 This study analyzes the US market for electronic security alarm systems. Excluded from the scope of the study are security services such as alarm monitoring and systems integration, as well as installation and other service revenue. Also excluded are dedicated information security hardware and software (e.g., computer network access devices, encryption, firewalls, and virtual private networks). In addition, the study does not cover motor vehicle security systems, such as anti-theft, keyless entry, and vehicle recovery systems. Data from the US Census Department were consulted in the preparation of this study and a list of related codes is presented here for informational purposes. However, these codes may not include all products covered in this report or may exclude some products of interest and the data have thus been adjusted accordingly. Value gains in security alarm demand will be supported by ongoing product development focusing on providing end users with enhanced capabilities, such as improved ease of use and installation, remote monitoring, and interoperability with other security and building automation systems. Gains will be particularly rapid in the relatively small PERS segment, supported by an increasing base of potential end users as the US population continues to gray. Through 2021, overall security alarm demand is expected to increase 5.1% annually. How does alarm usage vary by end use market? Which product developments will drive upgrade sales? How do trends in reported and perceived risk of crime impact sales of security alarms? Central station alarms are monitored systems that notify operators at a private facility, who then follow up by verifying the alarm and contacting the owners of the building and local authorities, who can then be dispatched to the scene. The alarms also create an audible signal that is designed to alert those who are present in the building. Direct connect alarms are monitored alarms, like central station alarms; however, these alarms are connected directly to public safety officials (typically a local dispatch station). Intrusion alarms are used to notify alarm owners when someone or something enters a premises at unauthorized times or in unauthorized areas. Most alarms are set to trip given a specific event, such as sensing when a window breaks or when something moves within a perimeter during a particular time. Alarms, including smoke, fire, and carbon monoxide detectors, that are used to detect potentially life threatening environmental factors. Local alarms are stand-alone devices that make an audible or visible signal when the unit is triggered. Newer, connected devices that allow end users to self-monitor the alarm from their computer or mobile device also fall within this segment. Alarms and detectors that are used by individuals who may be in a vulnerable position (e.g., an elderly individual living at home alone) in order to quickly call for help in the case of an emergency. Conventional PERS systems feature a portable panic button (worn on a pendant or on the wrist) and a base unit that sends signals to the central station or other entity monitoring the device, alerting them to a problem.